Cindy Wooden is chief of the Rome bureau of Catholic News Service. She has been reporting on the Vatican and the Catholic Church since 1989. She has traveled around the world with John Paul II, Benedict XVI, and now Pope Francis. As a result of this work, she is respected as an authority on the life and workings of the church. She is the author of Luis Antonio Tagle: Leading by Listening. Joshua J. McElwee is National Catholic Reporter's Vatican correspondent and a contributor to the Italian news website Vatican Insider. He has reported on Pope Francis from 23 countries and his work has earned numerous awards from the Catholic Press Association. He is the author of Ten Things Pope Francis Wants You to Know About the Family. This book transcends mere words. If someone really wants to understand Pope Francis, they have to read this book. You cannot write, you cannot understand the attitude of the Vatican, you cannot understand Pope Francis if you have not read this book. These words, these ideas of Pope Francis that are explained in this book are the background philosophy of all that Pope Francis is doing. This accessible, inspiring, and often entertaining collection is an invaluable resource for anyone seeking to understand the fullness and richness of Pope Francis' thought. I finished it inspired to get out into the field hospital and embrace our world with hope. What I found most delightful about A Pope Francis Lexicon is that from these individual essays I learned not only about Francis' characteristic use of language but the essayist's own "take" on what the Pope has to say. I strongly recommend the work, not only for those who already admire Pope Francis' thought and action but perhaps especially for those who are being invited to conversion of heart and mind. There's an amazingly interesting book on the store shelves now. It's all about Pope Francis and the words he uses in his writings, in his talks, and in his everyday conversations with priests, heads of state and the ordinary folks he comes in contact with each day. If you have every found yourself uncertain about what Pope Francis was saying and wanted to better understand him and the direction in which is leading our Church, the help you're seeking can be found in the pages of this book. How fitting that it is being published just as we celebrate the fifth anniversary of Pope Francis' election. Joshua J. McElwee and Cindy Wooden have brought together an outstanding collection of writings on Pope Francis' leadership from major figures in the Church and wider Catholic life. A Pope Francis Lexicon is a valuable guide to the words and ideas that form the foundation of Francis' papacy. It rightly belongs on the shelf of anyone interested in the direction of the Catholic Church today. This new book is a must read in 2018! A real gem and key lexicon for understanding Pope Francis! This brilliant collection fizzes with the tension and tumult of this most provocative and enigmatic of papacies. Francis-the top-down decentralizer, the champion of the peripheries who draws the world's attention to the personality at the center, the blunt speaker who leaves exasperated critics demanding tidiness and clarity-has triggered a creative commotion. No one writer has ever quite captured it; McElwee and Wooden's kaleidoscope comes close. What an interesting idea: ask a wide range of writers and thinkers to reflect on Pope Francis's words. The result: this collection of intelligent and accessible essays. This is a book to keep on the bedside table and delve into over and over again. 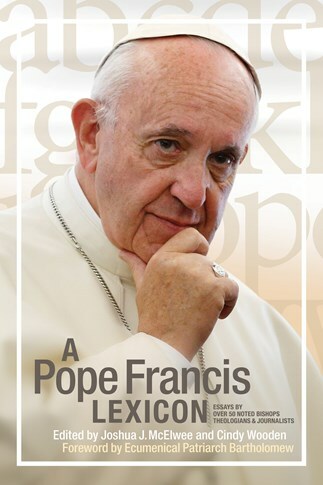 A Pope Francis Lexicon is a compact yet comprehensive anthology of the themes that have come to define the Francis papacy. The diverse array of contributors make A Pope Francis Lexicon essential reading for anyone wishing to better understand the program of this "pope of many firsts." Gretchen R. Crowe, editor of Our Sunday Visitor and author of Why the Rosary, Why Now? A Pope Francis Lexicon is a helpful addition to the ever-expanding literature on Pope Francis. This collection will no doubt be greeted with gratitude by those desiring personal growth through reflection on the Pope's words and actions, especially his determination to build bridges, foster receptive dialogue and multiply opportunities for encounter.